This chapter describes a field director's revision of a field experience placement system and model for a teacher education program at a two-year institution. In this case study, the field director documented the conversion from a paper system to using a learning management system to support the field experience process of 324 students. Results from this case study indicate a positive correlation between the components of the process and the features of the learning management system. In addition, findings from the case study reveal that the learning management system provides additional benefits for program assessment. 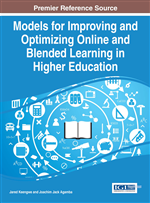 The conversion of a paper system to a learning management system is documented as well as the implications for other aspects of teacher education assessment. Teacher education is a dynamic field of study that bridges theory into practice. This application manifests itself in the teaching continuum through methods courses and field experiences. The National Council for Accreditation of Teacher Education (NCATE) defines Field experience as a variety of early and ongoing field based opportunities in which candidates may observe, assist, tutor, instruct and or conduct research. Field experiences may occur in off-campus settings such as schools, community centers or homeless shelters (NCATE, 2008). Field experiences are a cornerstone in preservice teacher education programs and they are encouraged to occur early and often.